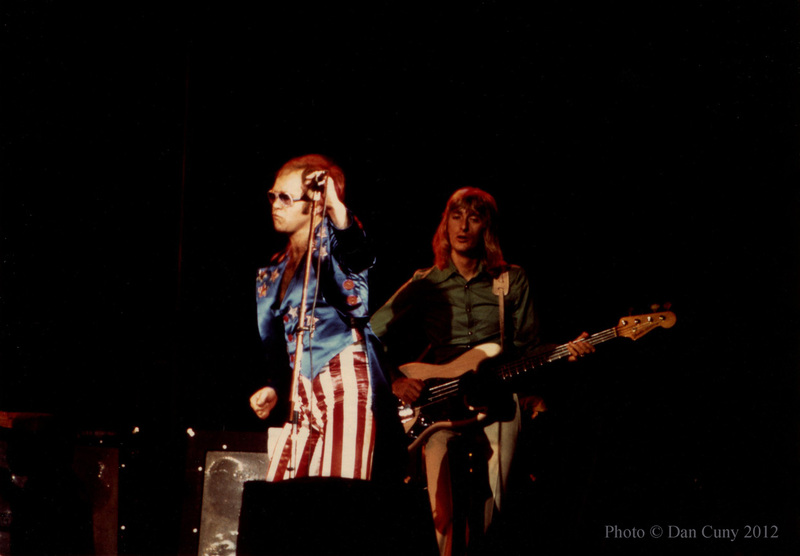 Editor's Note: Regrettably, most of Dan Cuny's photos from this particular show have been lost, leaving us with fewer photos than usual, but we believe that these shots of Elton John and his band in their prime are worthy of being seen. Reginald Kenneth Dwight (later known to the world as Sir Elton Hercules John) was born in Pinner, Middlesex, England, in 1947. He began to play the piano as a child, and started formal lessons at the age of seven. When he was eleven, his marked abilities as a pianist helped him to gain admission to the Royal Academy of Music in London, where he had the opportunity to polish his skills and study the serious music of the great composers. He also displayed an eager fondness for the less constrained sounds of rock'n'roll. By the age of fifteen, he was playing standards in a local pub on weekends. In the middle of the 1960s, Reg Dwight was a key member of Bluesology, playing in clubs in the United Kingdom and Germany, and also providing backing for American musicians. Bluesology released two singles, "Come Back, Baby" and "Mr. Frantic" (both written and sung by Reg Dwight), and later formed an alliance with a well-known singer, Long John Baldry. After Reg Dwight quit Bluesology in late 1967, he changed his name to "Elton John" (borrowing "Elton" from Elton Dean, another member of Bluesology, and "John" from Long John Baldry), and began to write songs with Bernie Taupin, an aspiring lyricist from Lincolnshire, England. Elton John's first album, Empty Sky, comprising nine songs that he had written with Bernie Taupin, was released on DJM Records in 1969. His second album, Elton John (1970), was a breakthrough that showed a strong progression in his talent as a musician and a songwriter, as particularly evidenced by "Your Song," "Take Me to the Pilot," "Sixty Years On," "Border Song," and "The Cage." It also was the first of Elton John's albums to feature Gus Dudgeon as producer and Paul Buckmaster as arranger. When "Your Song," a tender ballad that sweetly depicted the uncertainties of youthful romance, was released as single, it became a sizable hit, firmly establishing Elton John as an up-and-coming performer of major potential. Elton John was quickly succeeded by Tumbleweed Connection (a collection of songs inspired by Bernie Taupin's interest in tales of the American West) in 1970, 17-11-70 (a live album taken from a radio broadcast in New York City, known as 11-17-70 in the United States) and Madman Across the Water (with "Tiny Dancer," "Levon," "Madman Across the Water," and "Indian Sunset" among its best tracks) in 1971. Next came Honky Chateau in 1972, which offered two more hits, "Honky Cat" and "Rocket Man (I Think It's Going to Be a Long, Long Time"). 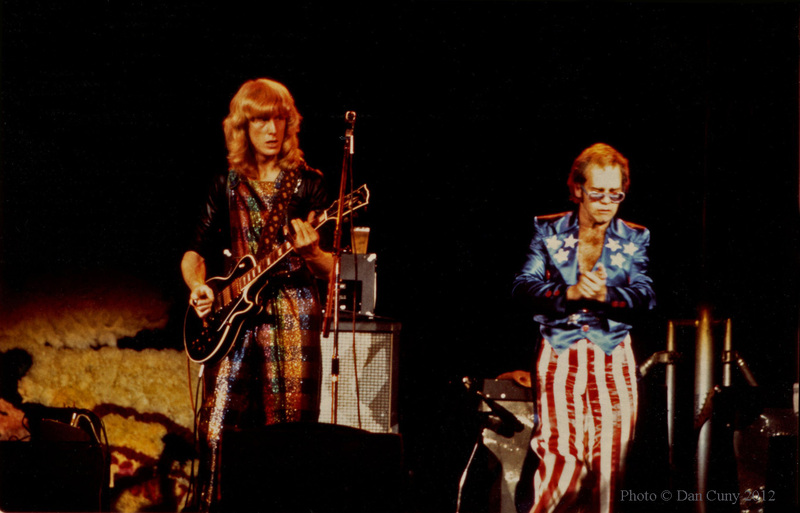 By that time, Elton John had assembled a steady band that featured Davey Johnstone on guitar, Dee Murray on bass, and Nigel Olsson on drums. When Elton John performed at the Oakland Coliseum Arena in September, 1973, he was on the verge of becoming one of the foremost superstars of the 1970s. Earlier in the year he had released Don't Shoot Me I'm Only the Piano Player, an album that contained two of his biggest hits, "Crocodile Rock" (his first #1 in America) and "Daniel." He was about to release Goodbye Yellow Brick Road, the double album that would elevate him to the highest realm of stardom. Elton John displayed a vigorous, inventive style on the piano, and proved himself to be an extremely exciting performer, with a bold flair for old-fashioned showmanship. He kicked up a gleeful storm onstage and left no doubt whatsoever that he knew how to thoroughly entertain an audience. David: My friends and I saw Elton John twice. The first time was September, 1973. Elton John was reaching the peak of his creativity with the release of Goodbye Yellow Brick Road. His three band members were amazingly talented and put on one of the best live shows that I ever saw. They moved from rockers to ballads and even to jazz, finally building to an almost frenzied climax. The second time I saw Elton John was in October, 1974. Ray Cooper had been added on percussion. I don't think he was an improvement, and was somewhat distracting (if not annoying) at times. Although it was still a great concert, the second show was more glitz and less content. "Madman Across the Water" and "Have Mercy on the Criminal" were not played, and they had been highlights at the first concert. 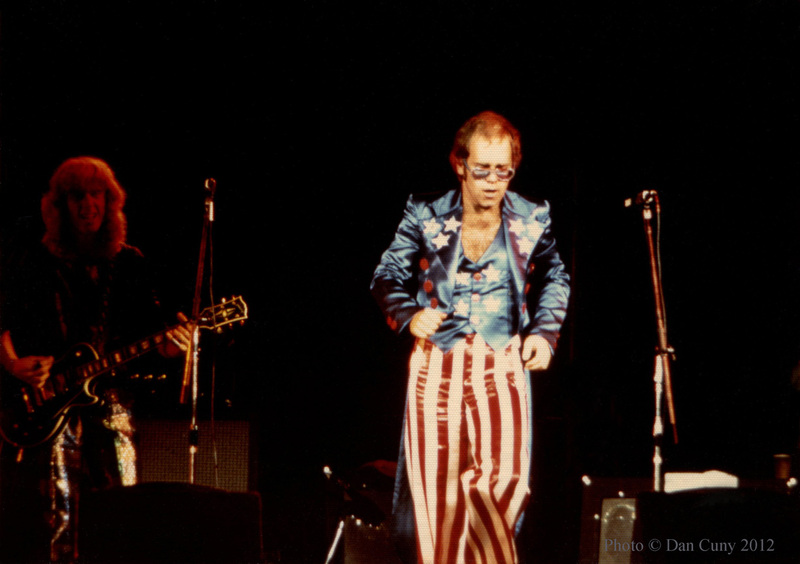 At the first concert in 1973, Elton walked out on stage in a multicolored cape, covered from shoulder to foot. He looked like a float in a parade. He wore his giant ELTON glasses that flashed on and off. His hair had a red stripe on each side of his head. He dropped his cape to reveal an Uncle Sam outfit. The audience went crazy. I believe he opened with "Elderberry Wine." The show proceeded with hits from all of his albums. For "Madman Across the Water," he sat at the piano with a single spotlight shining down on him. He played long, complicated improvisations, with some jazz elements, that showed his musical talent and his versatility. It was one of my favorite parts of the show. When he announced "Your Song," he told the audience that it was for Bill Graham, and said that it was "His Song." A nice tribute to the rock promoter. When the show ended, everyone pounded their hands and feet for an encore. The band walked back on stage and the audience went silent. The anticipation was high. I remember that it was on a Sunday night. Elton sat down at the piano, leaned toward the microphone and said, "This is a song about last night." The audience cheered as the band ripped into "Saturday Night's Alright for Fighting." Everyone in the crowd leaped to their feet. I looked into the upper section of the huge auditorium, and saw some guys pushing each other with their fists and laughing as they pretended to fight. I looked all around me and saw thousands of people jumping up and down and clapping to the beat. Everybody in the packed house was in wild motion and singing along. Davey Johnstone hammered out the chords like punches to the gut, as Nigel Olsson slammed the drums. 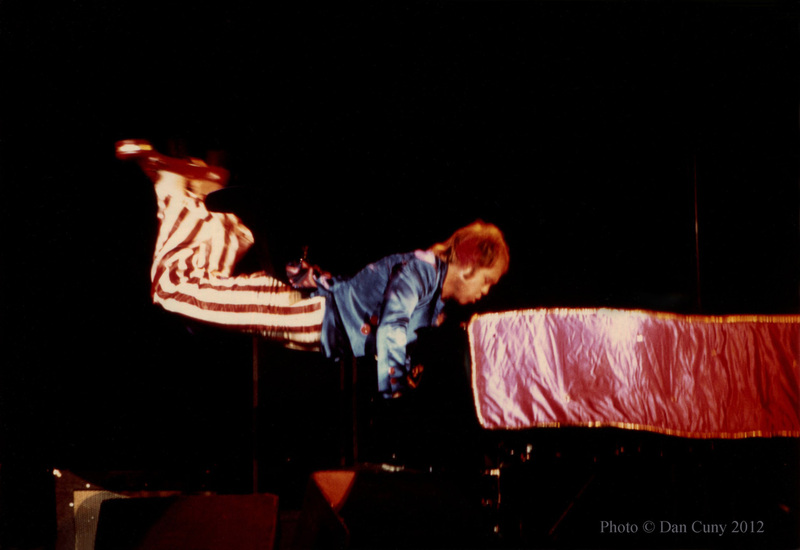 The topper was when Elton leaned forward, pounding the piano, and kicked his feet high into the air. He went horizontal to the piano. He seemed to defy gravity! That remains the single most exciting moment at any concert that I ever saw. As I left the auditorium, I walked past the stage and saw pieces that had dropped off the cape that Elton had worn at the beginning. I picked a few of them up and still have them in my scrapbook today. I walked out with the crowd and overheard a girl, who was obviously overcome with the excitement, say, "I think I'm in love!" Gary: This was one of the few big arena concerts we saw that was really great. I liked Elton John. "Your Song" was always on the radio during my high school years. I loved the singles ("Tiny Dancer" and "Levon") off Madman Across the Water, my favorite of his LPs. I remember hearing Tumbleweed Connection and 11-17-70 for the first time, and being very impressed with them. I loved Paul Buckmaster's string arrangements, which were bold and earthy, and really pushed the music. The concert at Oakland Coliseum Arena in 1973 was very strong. 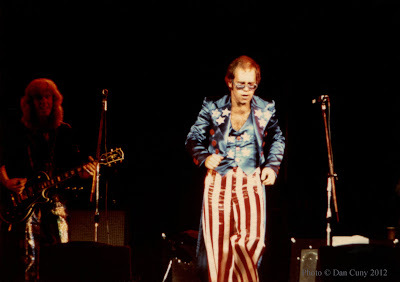 Elton John was dressed in his Uncle Sam costume (red and white striped pants, and blue topcoat with white stars). I remember the solo version of "Madman Across the Water" with Elton in the spotlight. I also remember the incident that David describes, with two guys in the audience mock fighting during "Saturday Night's Alright for Fighting," when everyone jumped to their feet. The band had a lot of directions and was brimming with talent. Dee Murray's bass playing added a nice foundation, and was a thoughtful part of the music. (It was very tragic that he passed away before his time.) 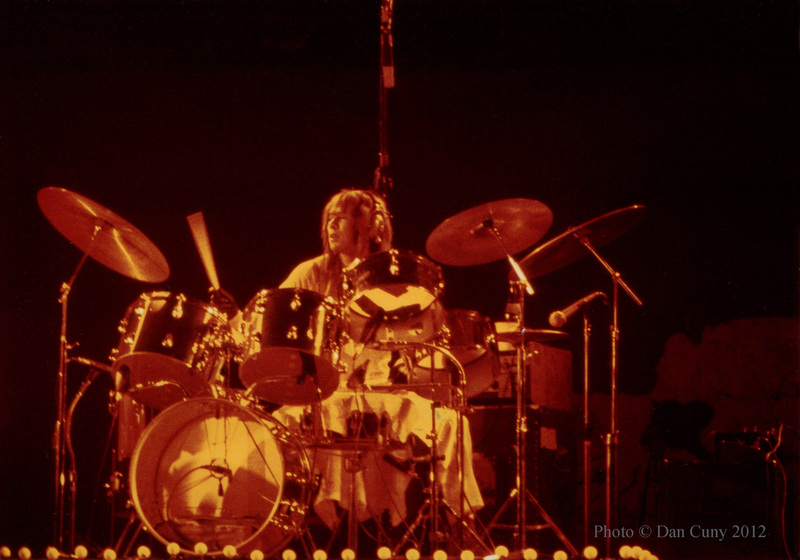 Nigel Olsson was a powerful drummer and showman. 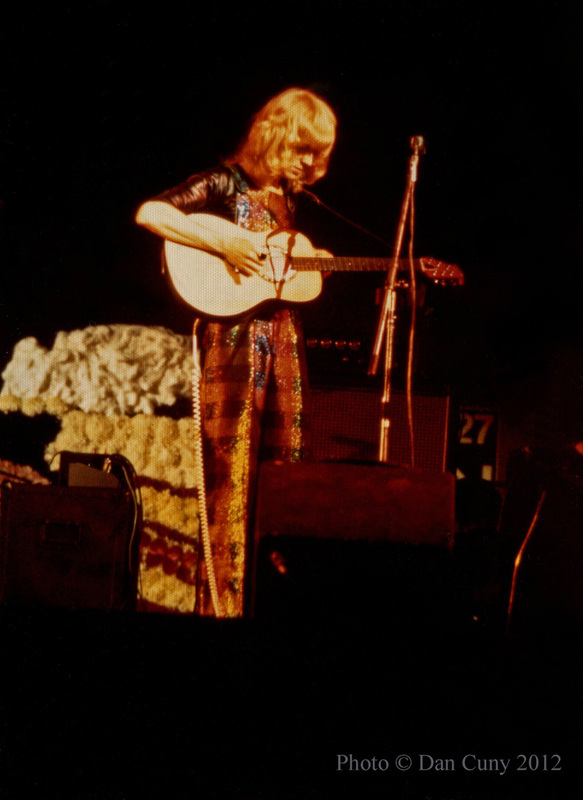 In addition to his electric guitar, Davey Johnstone had what looked like an Ovation acoustic guitar. 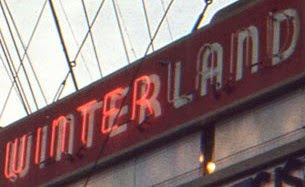 Seeing The Sutherland Brothers and Quiver was great, too. Very interesting music, with country and folk influences. I was a big fan of Tim Renwick (a very skilled, precise guitarist). The second time we saw Elton John, in 1974, was tamer, but still enjoyable. It was nice to see Kiki Dee open for him at that show, around the time of her single, "I've Got the Music in Me." Her band was great. All in all, the concert in 1973 was very good. The earlier Elton John LPs are my favorites, but Goodbye Yellow Brick Road is really a masterpiece, well done with a lot of variety. It was nice to see that band early on. Dan: Elton John was one of my favorite artists in the 1970s, and still is today. I can remember seeing him on television, doing "Your Song" and "Take Me to the Pilot" on The Mike Douglas Show in 1970. As a result of that show, I became an Elton John fan. When my friends and I saw that he was coming to the Oakland Coliseum Arena, we knew that we had to go there to see him, as his stage shows were getting more and more outrageous from what we read in Melody Maker. We had pretty good seats for the show, as we normally did. The opening act, The Sutherland Brothers and Quiver, did a forty-five minute set, which we enjoyed. It was rare to see them on tour and their set was tight. When the lights went on after their set, and the roadies were putting things together for Elton John, you could really feel the excitement. 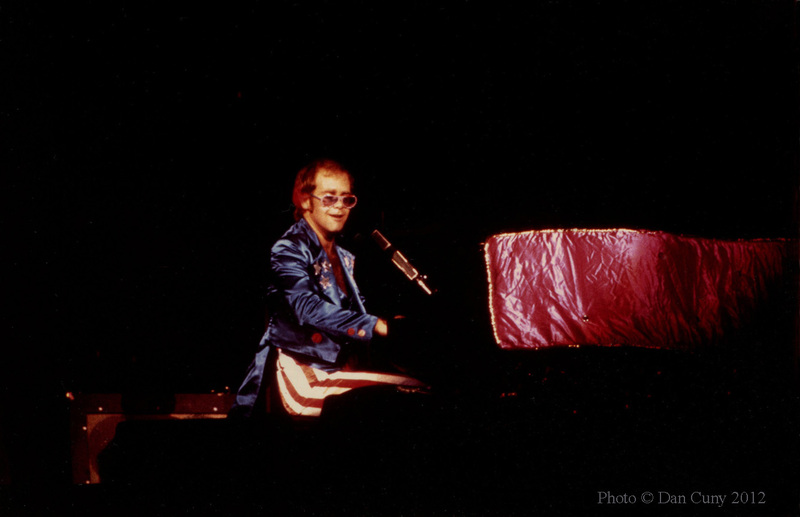 To this day, I still remember Elton John coming on stage with his ELTON glasses, his cape, and his red, white, and blue suit. The crowd went absolutely crazy. This was one of Elton John's peak times, as he was just about to release Goodbye Yellow Brick Road. I remember him playing "High Flying Bird," "Daniel," "Rocket Man," "Honky Cat," and Saturday Night's Alright for Fighting." I'm sure that he did others, but those stood out for me. Elton's stage presence was mesmerizing, and he really brought down the house when he kicked his legs in the air while playing the piano... a real magic moment. One of the other things that I can remember, as clear as day, was Davey Johnstone's flowing blond hair as he was playing guitar. I was watching him quite a bit, along with Nigel Olsson, who had headphones on while he played and also wore gloves, which I had never seen at a concert before. Dee Murray's bass was excellent, as always. I got some really good shots at this show and I'm glad I did, as it was one my favorite shows. Michael: I was a dedicated fan of Elton John right from the start, when I first heard tracks from Elton John on FM radio. (Actually, I probably heard tracks from Empty Sky even before that.) 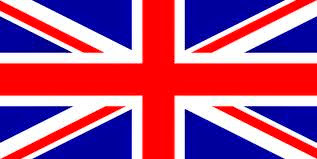 I thought that Elton John was one of the finest musicians and songwriters to come out of England since The Beatles. In addition, because I had a strong interest in the use of words, I also was a keen fan of Bernie Taupin, a gifted wordsmith whose thoughtful lyrics always fit perfectly with Elton John's tunes. They had an extraordinary partnership, and their many songs were among the best compositions of that time. Elton John already was quite well-known when he came to Oakland in 1973, but he had not attained the full extent of his later fame. (In other words, he was famous, but not "too famous.") He had not yet been overtaken by the unwieldy force of his own renown, as frequently happens with musicians of his stature, so his performance in Oakland was direct and joyful, without the stale feeling of someone merely going through the motions. It seemed that Elton John honestly enjoyed what he was doing, for its own sake. When we saw him perform again, a year later, his fame had increased considerably, but the show was less enjoyable. As I remember, he began his performance in 1973 with a straightforward rendering of "Elderberry Wine," a sturdy rocker from his latest album, Don't Shoot Me I'm Only the Piano Player. From the first moment, the tone of Elton John's piano was strong and lively, and there was no question that he was leading the band. He played "Your Song" (of course), and number of his other hits, including "Honky Cat," "Rocket Man," "Madman Across the Water," "Daniel," "Crocodile Rock," and "Saturday Night's Alright for Fighting." I especially remember his rendering of "High Flying Bird," a slow and heartfelt song on which Elton John's vocal had a particular quality of depth and expressiveness. He also previewed a few songs from Goodbye Yellow Brick Road. The band itself was never less than outstanding. In particular, the electric guitar of Davey Johnstone brought a hard, but quite tasteful, edge to the music. Dee Murray and Nigel Olsson also gave expert performances. The musicians who played with Elton John at the Oakland Coliseum Arena were extremely talented, and they did a great deal more than merely provide backing for the star of the evening. Together, they all came across as an actual band, with Elton John being the prime member. As a performer, Elton John had much in common with Liberace (another pianist who was fond of garish outfits), but he also had a bit of Jerry Lee Lewis and Little Richard about him. When he became excited by the music, he would stand up and push away the stool on which he had been sitting, and if I remember correctly, during one song he jumped on top of his piano and strutted. He appeared to be having an inordinately good time, and he clearly relished any opportunity to be in the spotlight. Elton John, with his unbeatable combination of ability and personality, truly was one of the greatest performers in rock'n'roll during the 1970s. Excellent as always. Cool photos and great recollections. Thanks ~ Ian S.
This reminds me of my childhood days and Elton John's music really rocks my world up until now. 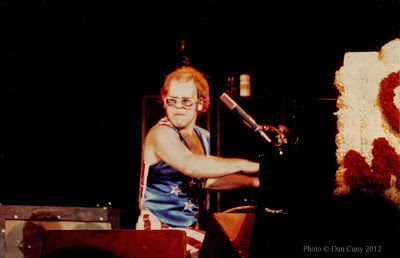 Like yourself I have some great Elton concert memories from the 70's. You have some amazing photos. I was thinking about this concert today. It was my first big concert. We were sitting up behind the stage and had a good view. I remember Elton's entrance (and the hair dye and his kicking his feet in the air). I also recall at one point he played the piano for some time while the arena was completely dark. I remember we commented we could still hear the music in our heads on the way home. I just wish I recalled more specifics. I still enjoy his music today and recently listened to a couple of his earlier CDs on my way to/from work. Really appreciate the article and the links. Thank you.